For about I year I watched the progress of a new small brewery here in my own town of Richardson. It was established by two experienced home brewers that wanted to take the next step and open up their own establishment. It was called Four Bullets Brewery and has finally had its soft opening, with the official grand opening scheduled in a couple months. It’s been open on Saturdays from noon to six with the typical tour deal – ten bucks for a glass and three beer tickets. 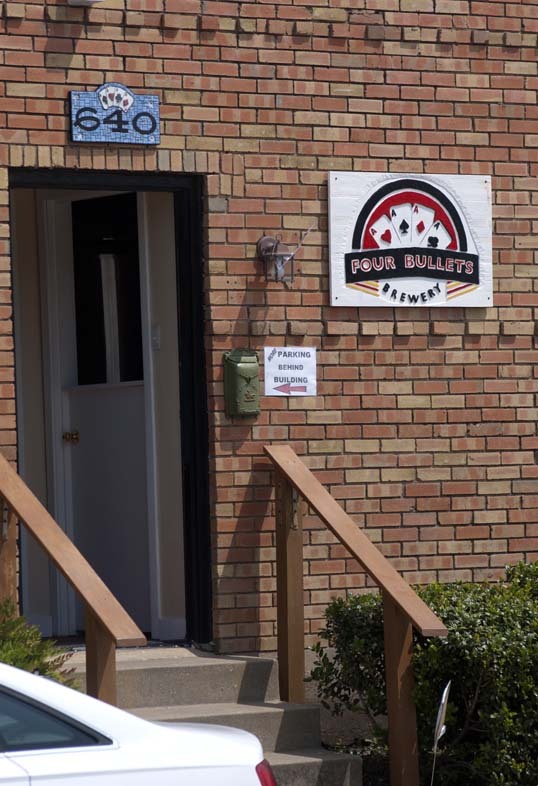 I have been enjoying these craft beer tours for a few years now and really wanted to check out Four Bullets. The last couple weeks were too busy for me but today I was able to make a visit. The brewery is located in a little industrial area north of downtown, near the Arapaho DART train station. It’s very close to where I live – but there is a railroad track blocking the way, so I rode north past the rail station and doubled back. It was a nice, easy ride, about three and a half miles. 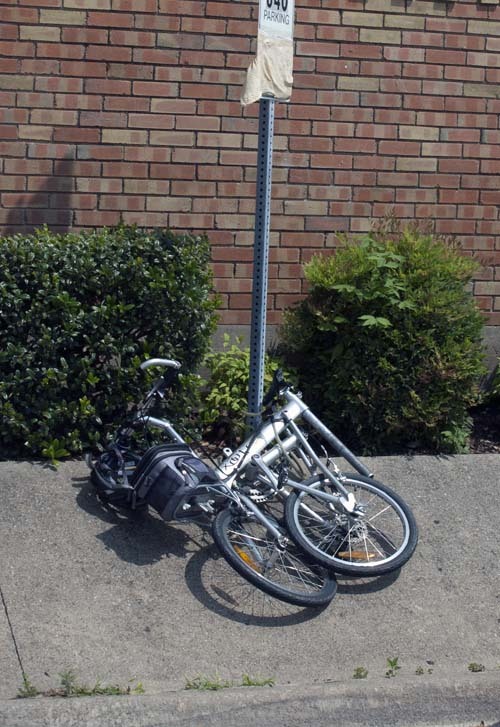 I folded my Xootr Swift and locked it to a sign out in front – I should have ridden around to the back of the building, but I didn’t know. My bike folded and locked up in front of Four Bullets. The brewery is small – about the size of a generous garage, but it has an extensive open area out back with tables and some games. The crowd grew throughout the time I was there, until they had a very respectable bunch hanging around. A food truck sold barbeque in the back – he had his smoker located upwind and the smell made it impossible to resist. The crowd grows in the patio in back of the Brewery. I’m not expert on beers – but I enjoyed the three I tried. They all had the complexity and freshness you expect in a small batch craft beer. I especially liked the Oatmeal Stout – excellent and not too heavy, and the Pale Ale – very drinkable with a lot of flavor without being too hoppy. It’ll be interesting to watch Four Bullets as they go along – see if they get more adventurous with their beer varieties. The City of Richardson looks at this industrial park as a potential little Design District – with the same kind of development – restaurants, galleries, breweries – that Dallas is working on in the area between downtown and the river. 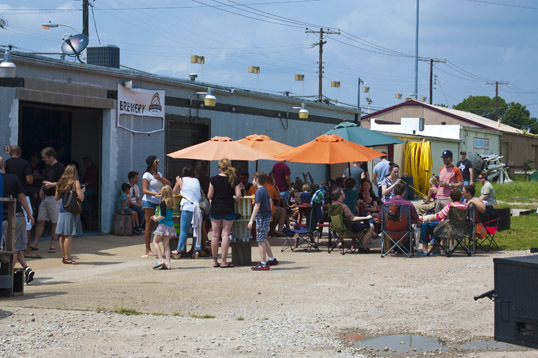 A food truck park is slated to open soon. I hope the trend continues – it would be a cool thing. I will definitely go back, maybe try and organize a bike ride from a DART station through the east side of the city down to the brewery.